Shake up your bar this Spring! Get your bar set and stylish! 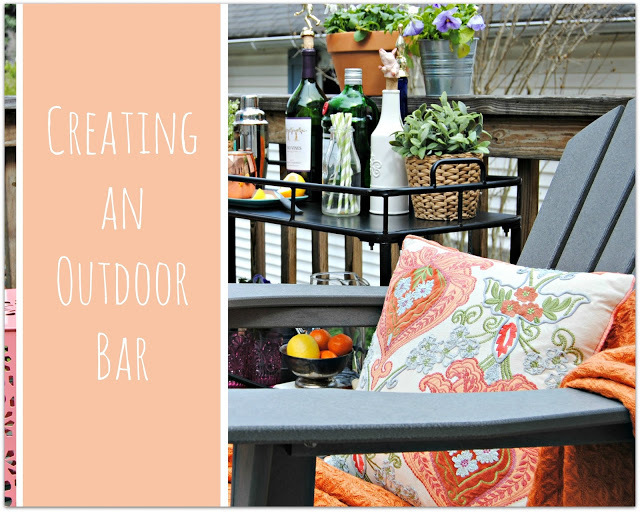 Copy some of my tips to create your own entertainment area for Spring. My bar was neglected since the holidays, so it was time for a little cleaning and freshening up. I removed all the old crap and gave my cart a good cleaning. Editing was key. I realized I had far too many glasses. Unless I was going to open a catering company some time soon, there was no need for all the glasses I had. So, I kept the necessities, which were my stemless gold wine glasses I purchased when World Market opened up in my neighborhood. Next, I routed through the alcohol. Some bottle were so old and grimy, there was no way I was every going to be serving anything out of them. The recycle bin was full by the time I finished that part. I love using trays and bins in my displays. Using a flat basket tray, a wire container and a small wood drawer help keep things organized and added a little texture to the metal cart. A mini fiddle leaf tree was added next to the cart and some succulents to the main part. Greens were missing! I love the look of plants and flowers – real or faux, so I placed one of my favorite faux succulent plants on the bar top. If I could get myself dressed, I’d head to Produce Junction for some fresh flowers, but not today. There was a lot of necessary junk on my cart so I streamlined it and ditch some stuff. All the small items were corralled into jars and on trays. Looking for some more ideas for your home? Try these tips and tricks.